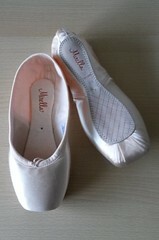 At various times during my pointe shoe researching all I end up with is a big question mark. I try to gather as much information as I can to offer you, my reader. Tonight I made a decision to let you know what pointe shoe brands I have on my “mystery” list and perhaps we can solve the puzzles together. 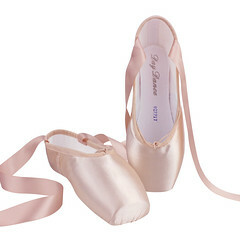 The more I research pointe shoes, the more I realize how little I know about all the available brands in the world. It is truly a vast market out there. I stumble upon these “mysterious” brands quite by accident and yet I am always thrilled by the discovery. 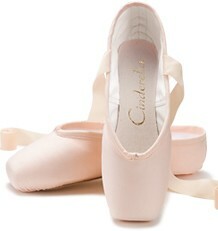 For me, it’s not important that the pointe shoe be popular with professional dancers. Finding an obscure brand is not unlike an archeologist becoming excited after finding a tiny piece of history. The digging was worth it! 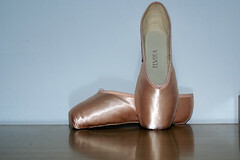 I found these Demi-Pointes on a Scottish website. 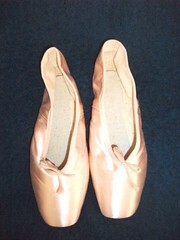 They are described as the Shoos Demi-Pointe. They are fully elasticized and come without shanks. 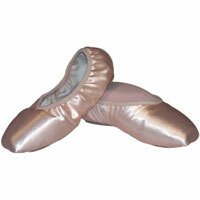 Of course, this makes me wonder if the Shoos company makes a regular pointe shoe too. 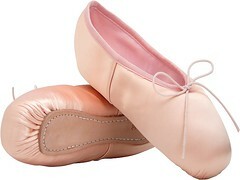 Shoos may very well be a Scottish pointe shoe manufacturer. 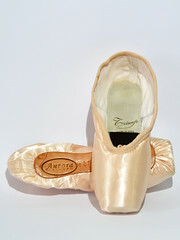 This entry was posted in Mystery Pointe Shoe Brands and tagged demi-pointe shoes, Pointe Shoe Brands, Pointe Shoe Images, Shoos Demi-Pointe. Bookmark the permalink. Excellent information! Really like your site. I am from Scotland and know which dance store these are from. I don’t know where the brand is from – I have tried searching for it, but unsuccessfully!